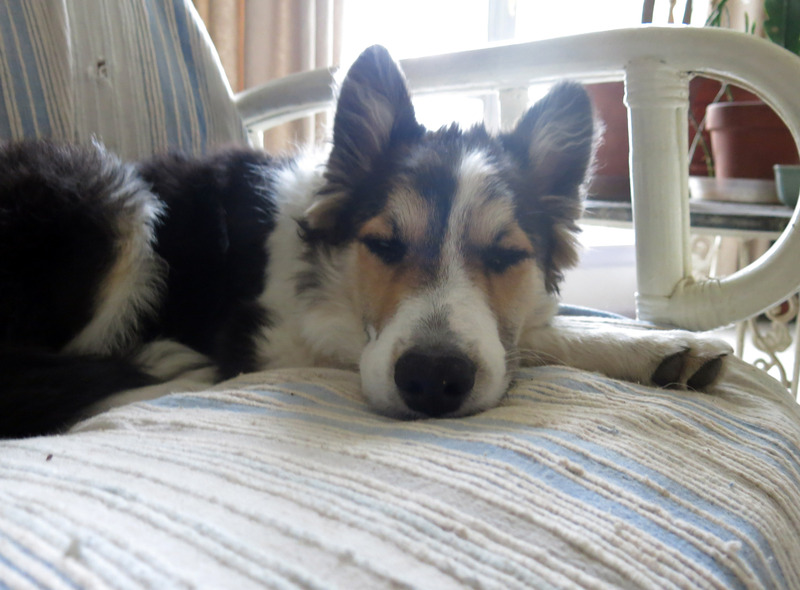 Greetings and salutations, everyone; yes, once again it is I, Mani the tiny, but less-tiny-than-yesterday, purebred border collie, filling in for the guy I live with, and here to bring you the latest news about me and my (sorry, our) garden. You may remember me from such posts as “Bunnies And Flies”, among so many others. Here I am in a characteristically relaxed pose. We’ve been doing hardly anything in the last few days, because it’s been raining. Not raining like it was before, but raining and thundering. The guy I live with said that’s all it did all last summer, but I don’t know what summer is, so that doesn’t mean much to me. He complains a lot anyway. There have been a lot of flies to chase, and that’s really fun. If you haven’t tried it, maybe you should. The guy I live with doesn’t like it when I chase really big flies, which he says are “bumblebees”, but they’re fun to chase too. Here I am doing exactly that. I know that, technically, I’m not supposed to be in the rock garden, but I was the star student at Puppy Day Care yesterday, so I must be doing something right, and the guy I live with must just be full of something. See? We quite occasionally have disagreements about stuff, but the guy I live with doesn’t have any stars, and I don’t know why he goes on so. 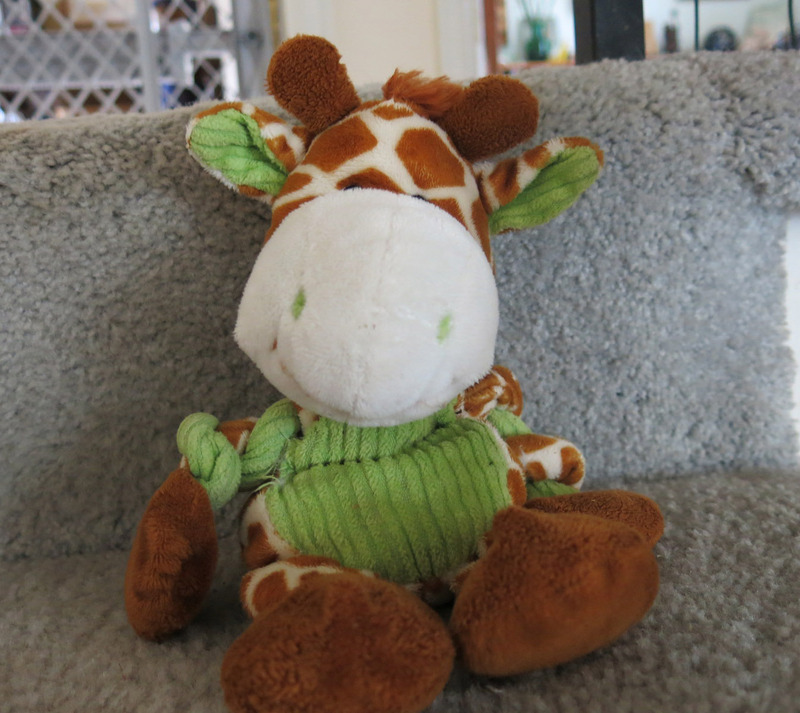 He insists that my giraffe is an “upstairs giraffe”, like it belongs in my upstairs fort at bedtime, but I think it also likes to go out in the rain, and get all soaking. In between hunting flies, we sometimes play tug-of-chew-toy. I’m better at it than he is. That’s really all that’s going on. Sometimes the guy I live with does go out and work in the garden, during the brief periods when it either isn’t raining or he isn’t taking a nap, but mostly he just sits at the kitchen table and stares out into space. I do that sometimes, too. I’ll let you go now, but before I do, I have a couple of movies for you. You might find them a bit avant garde, but these were taken at night, of course, and the eerie flickering is the wind chimes, which you can also hear. They’re pretty good if you embiggen them, too. This one was taken from an ever-so-slightly different angle, as you can see when the wind chimes flicker. The guy I live with is so artistic, isn’t he? Oh, I didn’t get that at first, but now I do. Ha ha. Congratulations! You must be so proud of yourself for being such an outstanding puppy. Can the giraffe not be washed in a machine and dried in a delicate cycle? We could really use rain in NYC. Thanks; I guess I am proud. The guy I live with washes and dries my toys, and also performs any necessary surgery on them, stitching them up, performing squeaker transplants, and so forth. I guess some of the toys have been here for a long time, and the guy I live with helps me take care of them. I know, everyone has been saying they need rain, and here we need sun. Why is that, exactly? There are a lot of things about life that I don’t understand. Thanks; I’ll have everyone know that I ranked “great” in obedience, no matter what you might hear later. I guess if it isn’t going to rain on the west coast that these movies will have to do. The guy I live with would just as soon send the rain there. We even saw a slug yesterday. It was moving very slowly. The only thing that I’ve seen move slower is the guy I live with when he’s about to do something. Oh, what a pretty garden you have, Mani. I hope you are proud to claim it. Hmm. Obedience. I understand the guy you live with does not believe in doggie punishment – exactly right – but did I not read about your banishment to a corner? I think we never got to hear the full story of the tinkle on the bed. Believe me, that would be a momentous occurrence in *our* household. There Would Be Drama. And about drama, Cannes Film Festival was last week, and it is my thought that the two films you show are worthy of Cannes submittal for some Prix or other, perhaps under the category of Zen New Wave. Thanks; I do like to think the garden is mine, and that the guy I live with is just being bossy about it. It wasn’t so much that I was banished, but that there was yelling, and that was scary, and so I hid in the corner. I am, after all, still little, and sometimes a guy just has to tinkle where he can. I mostly go outside, but, you know, not always. It wasn’t even a tenth of an inch of rain, by the way. Just loud, and it fell all at once. The whole rain was just about the two movies, and that was it. And sometimes a guy just has to yell. Particularly when tinkle happens in forbidden space. Mani “your” garden is very beautiful. One could say it looks lush, probably not the usual description for your location. I’ve been reading the old blogs and am up to Sept. 2012. Things were pretty dry then. I am enjoying these older blogs very much, although there is some sadness. Perhaps once in a while, just for variety, you could let TGYLW write a bit. Just now and then, when we need firm instruction about something or other. Not that you aren’t great, because you are. Do you recognize the toys after they are washed? I mentioned once that Daisy’s favorite toy is her hedgehog, and it’s the crustiest of the lot. Are they as fun when they are clean? Thanks; it is very lush. Mostly with weeds, according to the guy I live with. He doesn’t do much firm instruction these days. Except that I think he’s mad at me because I accidentally tinkled on the bed again, though he hasn’t said anything. (I know that wasn’t what you meant.) One thing that’s been noticed here is some fungus on plants that aren’t adapted to having their leaves wet all the time, and I guess he’s going to sprinkle them with Bordeaux Mixture, but most plants are just getting bigger and bigger with all the rain. The toys seem the same after they’re washed. Better, even. 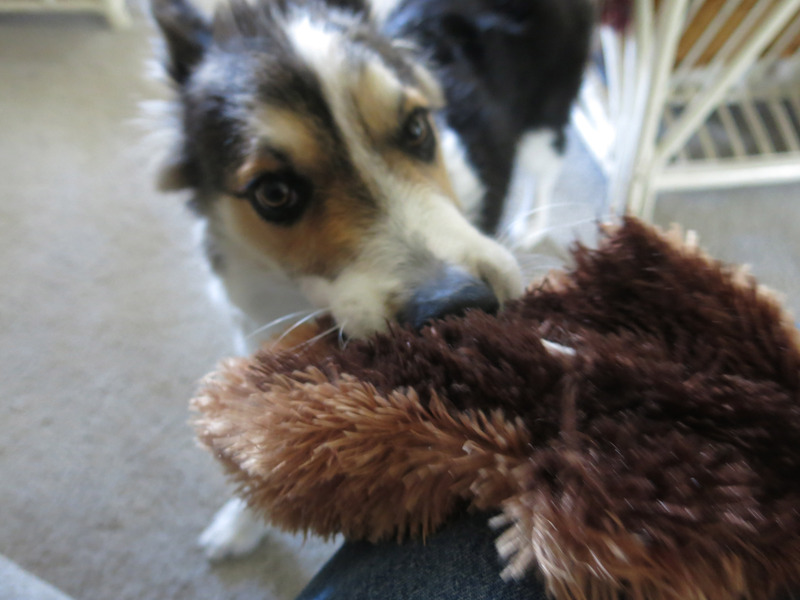 It’s important to do that if the toys get dirty, because the dirt can wear down my teeth, which happened to some of the other border collies here. So the toys are always kept clean, and since there are a lot of them, they can be rotated. I had a 1/2 Border Collie when I lived on a creek. One time she found a freshwater mussel in the creek and she thought it was delicious. All food was delicious to her. Anyway, ever after that she would pull rocks out of the creek and try to crack them like that mussel. She never found another but never stopped looking. Her teeth weren’t in very good shape. Daisy isn’t allowed to take her toys outside, so they are just crusty with dog spit. Yum. Cold-water wash with a “natural” detergent will make toys just like new. The lunatic in a puppy suit here will eat anything, just to add to the daily food. Mani, you little peanut – the guy you live with must have studied the work of Jean Cocteau. The night movies very atmospheric reminiscent of “La Belle et La Bete” with the comforting drone of gently falling rain mixed with the slightly ominous reflections of the chimes. Who knew there could be such import in such simplicity? Indeed, the guy I live with has seen that movie; once owned in back in the days of something called “videotape”. I like to live a life full of import. Your gold star status is no surprise to those of us who are regular readers: we already know you are stellar. I find the toys of my pups pretty much everywhere — on the human beds; outdoors, on the stairs. . . I guess they want to have them handy wherever they might be when the urge to play strikes. Thanks; I figure I must be stellar in order to get stars, though the guy I live with claims this behavior only takes place at Day Care. The thing about toys is to have a lot of them, so that the ones that get dragged outside and left out in the rain can be washed, while there are nice clean dry ones on hand, too. That’s the philosophy around here. Hi Mani, I’m loving the rock garden and movies. It sure has rained a lot where you are, and other places out west. Maybe we in Michigan soaked up the last of the rain before it got to NYC. I prefer sharing the rain and spreading it around. Guess I should know now we humans don’t have control over that anymore than anything else. Mani, being a border collie and all I am wondering which one of you is actually directing those thunderstorm movies. Since it is mostly dark, excepting the one flash of lightning, I expect you would be making the movies from underneath something–since you ARE a border collie. I am willing to bet the photos of you on the couch are not during rain storms either. Thank you and thank you for posting dear puppy. Thanks; I was inside during all the filming business, though I haven’t yet discovered that thunder is scary. The guy I live with hopes I never will. It’s eleven in the morning on Friday and it’s raining. The day started out sunny but I guess not any more. Tinkling in the master’s/mistresse’s bed would be a very big no-no in this household. It deserves a serious scruff of the neck disciplining, just like your momma would have done in her den. Quite disrespectful for an almost 6 month old. No stars for you from this point of view. But, you’re still very cute. Well, you have to balance out the naughty with the nice, I guess. The garden looks splendid by day and by night lightning. Thanks; the guy I live with says the splendor is mostly from very green weeds, but that’s just him, you know. Mani, I must break the news that there appears to be some disconnect between what the guy you live with says and truthiness. 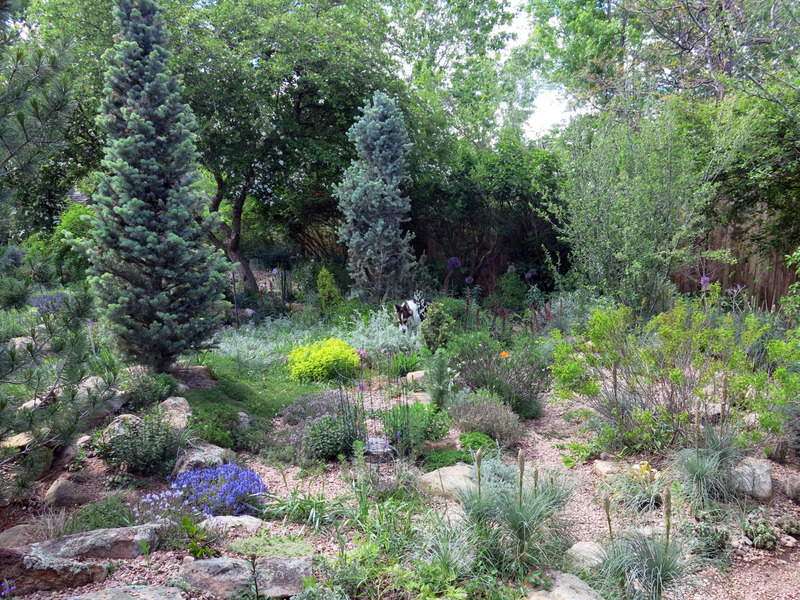 I embiggened the garden pic – the better to see you, my dear – and looked and looked, and nary a weed did I spy. What I did see is general garden splendor. Thanks; though, look in the lower left hand corner. Weed. Just to the left of the tiny Rhamnus microcarpa between the two rocks. And behind the golden oregano (Golden Anniversary I think) is a huge patch of grass invading everything. The grass is hopeless. It’s smooth brome, and the whole field, as well as every otherwise empty (developed, like bulldozed) space between here and the Sierras, is covered with smooth brome. That’s what I’m snacking on, while chasing bumblebees. It’s pretty good, actually. I guess. Smooth brome has been widely planted for erosion control, just to put something green in bulldozed places, and especially for forage. Has the guy you live with considered getting a cow to control the Smooth brome? Then you could “herd” it around the garden from site to site, exercising the innate skills I have heard tell of with respect to purebred border collies. Or maybe it could be a sheep? The guy I live with said that there are rules against keeping cows and sheeps here. We don’t live in the city, really; it’s a little development kind of on the outskirts of town, but they still have cow and sheep rules. When the smooth brome gets mowed by the county, it turns all brown (so it can catch on fire, maybe), and then weeds proliferate. All the weeds make seeds, and when the wind blows, guess where they all land?